No one needed finish line photography to pick the winner of the fifth annual Southeast Alabama Community Foundation Half Marathon on Saturday morning, 30 January 2016. Avery Ainsworth finished the 13.1-mile race through the streets of Dothan, Alabama almost a mile ahead of second place, posting a winning time of 1:15:50. The Montgomery, Alabama distance runner's time was a new course record for the SACF Half Marathon, crushing the previous record of 1:20:28 set by Sean Kent in 2013. After Ainsworth crossed the finish line at Flowers Hospital he had more than five minutes before the next runner arrived to get a drink, change his shoes, or whatever other post-race activity he had in mind. When that next runner did arrive, it was Dothan's Austin Fox, second in 1:21:15. Myles Gibson of Donalsonville, Georgia was the top master in the half marathon, finishing third overall in 1:23:50. Fran New won the women's title, running the half marathon in 1:40:56 and finishing thirteenth overall. Tan Winfield was the women's runner up, placing twentieth overall in 1:46:44, and Jessica Ludwig was third in the women's standings, 26th overall in 1:48:47. For the second year in a row Kathy Gannon was the top woman master in the SACF Half Marathon. This time around Gannon was the sixth female finisher, 29th overall in 1:49:57. 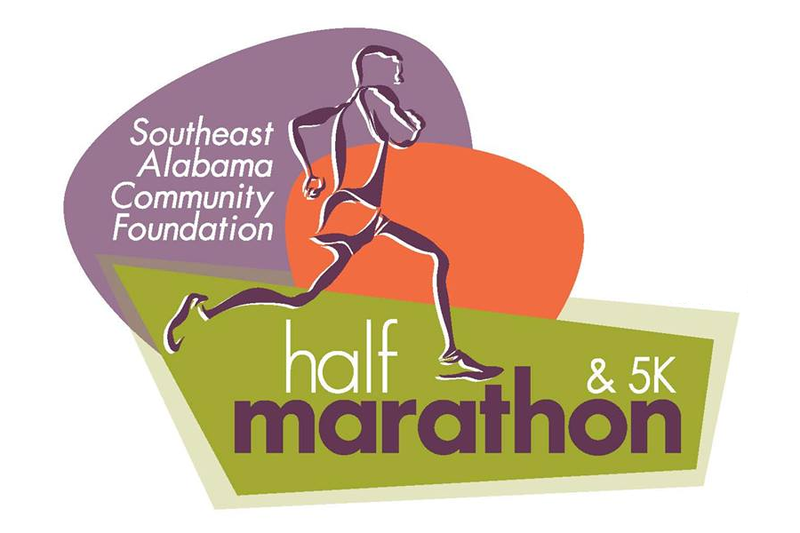 120 athletes finished the 2016 Southeast Alabama Community Foundation Half Marathon, with another 166 finishing the associated SACF 5K. About Time Events, LLC, of Prattville, Alabama provided chip timing and race management for the event. Racing through the hilly north side of Tallahassee, Florida, Paul Guyas won DeSoto Trail Elementary School's fourth annual Trailblazer 5K Run For Literacy on Saturday morning, 30 January 2016. Guyas covered the 3.1-mile course in 18:35, finishing more than 400 meters ahead of the next runner. Kate Chunka was the top woman in the race, placing thirteenth overall in 22:15. Behind Guyas, David Welling and T J Devlieger were in a close race for second, with Welling prevailing 20:18 to 20:22. Placing third, Devlieger was the top master runner in the race. Layla Thompson and Ella Grace Hodges, each eleven years old, took the next two spots in the women's standings after Chunka. Thompson was 22nd overall in 24:21 and Hodges placed 24th overall in 24:27. Birgit Maier-Katkin was the top woman master and the fourth female finisher in the Trailblazer 5K, coming in 33rd overall in 24:57. The 2016 Trailblazer 5K was run on a USATF-certified course that started and finished at DeSoto Trail Elementary School. 179 athletes finished the 5K, with another 140 completing a timed one-mile fun run. Chip timing for the Trailblazer Run For Literacy was provided by Gulf Winds Track Club of Tallahassee, Florida. After just the first four weekends of 2016, there have already been three five-kilometer road races on USATF-certified courses in Tallahassee, Florida. The third of those was the seventh annual Trent Trot 5K on Saturday morning, 23 January 2016. In spite of windy conditions, the race had some impact on this year's performance lists. The Trent Trot 5K winner, Matt Nazareth, was already third on the men's list after running 16:56 at Bowlegs; he remains at #3. Jake Mazziotta, the runner-up at the Trent Trot, appears on the 2016 list for the first time; his 17:30 puts him at #11. Mazziotta finished 2015 ranked twentieth in Tallahassee with a 17:06. Grady Smith also made the list for the first time in 2016. Smith's 18:11 at the Trent Trot puts him fourteenth among this year's performers. Ryan Truchelut improved his best time of 2016 from 18:26 at Bowlegs to 18:16 at Trent Trot, but fell on the list from fifteenth to sixteenth. Hunter Phillips debuted in the top 25 by posting 18:41 at Trent Trot, eighteenth on the list. Logan Venclauskas ran 19:18 at Trent Trot, breaking into the rankings at #25. Katie Sherron won the women's title at the Trent Trot 5K with a 19:36, but she had already run 19:08 earlier in the year at Bowlegs. Dr. Sherron remains second on the list. The Trent Trot was Caitlin Wilkey's first 5K race in town this year, though. Her 20:10 was good for second in the women's standings at Trent Trot, and third on the performance list. Brittney Barnes' 20:17 at Trent Trot is fourth on the women's list. Jillian Heddaeus lowered her best time of 2016 from 22:11 to 21:43, remaining fifth on the women's list. Laura McDermott broke onto the list at #7 with her Trent Trot time of 21:57. Laura Reina lowered her time to 22:29, but dipped slightly in the rankings from #8 to #9. Likewise, Emma Spencer took seven seconds off her Bowlegs time to run 22:43 at Trent Trot, but went from seventh to eleventh. Paula O'Neill lowered her time by 20 seconds, running 23:16, and slipped from thirteenth to fifteenth. With more runners logging top 25 performances in each race, it's hard to stay near the top of the rankings. Emma Travis was another runner new to the 2016 women's list after Trent Trot; her 23:35 ranks eighteenth. Deborah Congdon, Julie Clark, and Vaishali Desai improved their 2016 times to 23:44, 24:09, and 24:11, remaining in the top 25 at #19, #23, and #23. Expect more movement in the lists soon. There are two more races on USATF-certified 5K courses coming up on 30 January 2016; the Tulip Trot 5K and the 4th annual Trailblazer 5K. Those will be followed by the 4th annual Break-A-Leg 5K on 6 February 2016, the 23rd annual Run For The Cookies 5K on 13 February 2016, the Thomasville Road Baptist Church 5K on 5 March 2016, the 28th annual Shamrock Scurry 5K on 12 March 2016, the inaugural Florida High FAN 5K on 26 March 2016, the 41st annual Springtime 5K on 2 April 2016, the 9 annual FSU Autism 5K on 9 April 2016, and the highly competitive 42nd annual Palace Saloon 5K on 16 April 2016. And that just takes you into early spring. Trent Trot 5K (23 Jan 2016). Saturday, 23 January 2016, was cold and windy in Dothan, Alabama. It was the kind of weather that makes you think about indoor track, but in Westgate Park it was the occasion for a cross country race to raise funds for outdoor track--Dothan High's second annual High Noon Superbowl 5K Trail Race. Myles Gibson won the event, running the 3.1-miles on the Westgate Park Trail in 18:29. Kaderricka Adams took the women's title, placing tenth overall in 22:28. 75 athletes finished the race. Myles Gibson crossed the finish line nearly half a kilometer ahead of the next runner, but then it wasn't his first race on the Westgate Park Trail. On the same course the Donalsonville, Georgia, master runner has also won the Life Is A Beach 5K, the Brian Dowling 5K, the Love 2 Run 5K, and the Winter Olympics 5K--and that's just in the last two years. Tyveon Tharp has also raced at Westgate a few times as a junior on the Dothan High cross country team. Tharp was second in the High Noon 5K, running 20:20. Another Dothan High cross country runner, sophomore Michael Houston, nabbed third with a 20:30. Women's champ Kaderricka Adams may not have had the cross country credentials of the top men in the High Noon 5K, but she's certainly not an inexperienced runner. A junior on the Northside Methodist Academy track team, Adams is a two-time Alabama Independent Schools Association state champion in the girls' 800 meters. Macy Benton, the eight-grader ace of the Dothan High girls' cross country team, was second in the women's standing, placing 21st overall in 25:08. Molly Matthews, frosh-year runner on the Dothan High girls cross country squad, placed third on the women's side, 23rd overall in 25:23. Tulip Trot 5K and one-mile fun run. 8:30 AM ET one mile / 9:00 AM ET 5K. Cascades Park, 1001 South Gadsden Street, Tallahassee, Florida 32301. 2015 story. 2011 story. 2010 story. USATF certified course FL14149EBM. Event page on Facebook. Online registration at EventBrite.com. 4th annual Break-A-Leg 5K and one-mile fun run. 8:00 AM ET one mile / 8:30 AM ET 5K. Young Actors Theatre, 609 Glenview Drive, Tallahassee, Florida 32303. 2015 story. 2014 story. 2013 story. USATF certified course FL14019EBM. Event web page. Event page on Facebook. Online registration at RaceIt.com. James Madison Preparatory High School Mardi Gras 5K. 9:00 AM ET. North Florida Community College, 325 NW Turner Davis Drive, Madison, Florida 32340. Online registration at EventBrite.com. 3rd annual Race To The Amazon 5K. 8:00 AM ET. Wellborn Baptist Church, 4146 Lowe Lake Road, Wellborn, Florida 32094. Event page on Facebook. Online registration at RaceEntry.com. 23rd annual Run For The Cookies 5K and one-mile fun run. 8:30 AM ET one mile / 9:00 AM ET 5K. Tallahassee Community College Lifetime Sports Center, 444 Appleyard Drive, Tallahassee, Florida 32304. 2015 story. 2014 story. 2013 story. 2011 story. 2010 story. USATF certified 5K course FL14006EBM. Online registration at EventBrite.com. Dr. Jeanne O'Kon, okonj@tcc.fl.edu or 850-894-2019. 3rd annual Run 2-1-1 10K, 5K, and one-mile fun run. 8:00 AM ET one mile / 8:30 AM ET 10K & 5K. Southwood Town Center, Merchants Row Boulevard at Four Oaks Boulevard, Tallahassee, Florida. 2015 story. 2014 story. USATF certified 10K course FL16013EBM. USATF certified 5K course FL16012EBM. Event page on Facebook. Online registration at EventBrite.com. Kisses for CASA 5K. 9:00 AM ET. Florida State University Kappa Alpha Theta House, 510 West Park Avenue, Tallahassee, Florida 32301. Event page on Facebook. Online registration at tilt.com. "I Love Valdosta State University Cross Country" 5K. 8:00 AM ET. Valdosta Early College Academy, 1605 Azalea Drive, Valdosta, Georgia 31602. Online registration at RunSignUp.com. A Course/Line, LLC, acourseline@earthlink.net or 229-630-1455. Blue Wilderness Hero Run 5K. 9:00 AM ET. Blue Springs, 7450 NE 60th Street, High Springs, FL 32643. Online registration at EventBrite.com. Hamilton County Wellness Program and HIPPY 5K. 9:00 AM ET. Next to Jasper Post Office, 105 Martin Luther King Dr, Jasper, Florida 32052. Event page on Facebook. Online registration at RaceEntry.com. candido.perez@hamiltonfl.com or 386-792-6597. Heart to Heart 5K and one mile fun run. 8:00 AM ET one mile / 8:15 AM ET 5K. Coffee Regional Medical Center, 1101 Ocilla Road, Douglas, Georgia 31533. 2015 story. Course map. Event web page. Entry form and flyer. Online registration at RunSignUp.com. danny.mccarty@coffeeregional.org or 912-383-6988. 5th annual Apple Classic 10K and 5K. 9:00 AM CT. Hammock Bay, 74 Great Hammock Bend Freeport, Florida 32439. USATF certified 10K course FL15120EBM. USATF certified 5K course FL15119EBM. Event web site. Online registration at active.com. 11th annual Five Points Of Life 5K, and 1.2-mile kids' run. 8:00 AM ET 5K / 9:15 AM ET kids marathon. University of Florida Center for Performing Arts, Hull Road and SW 34th Street, Gainesville, Florida 32607. Event web site. Entry form and flyer. Online registration at active.com. 11th annual Five Points Of Life Marathon, Marathon Relay, and Half Marathon. 7:00 AM ET. University of Florida Center for Performing Arts, Hull Road and SW 34th Street, Gainesville, Florida 32607. USATF certified marathon course FL10002TY. USATF certified half marathon course FL06012DL. Event web site. Entry form and flyer. Online registration at active.com. 12th annual Kiwanis River Run 10K / 5K. 9:00 AM ET. Earle May Boat Basin, 100 Boat Basin Circle, Bainbridge, Georgia 39817. 2015 story. 2014 story. 2013 story. 2012 story. 2011 story. 10K is on USATF certified course GA05001WC. Entry form and flyer. Online registration at active.com. Strides For Scholars 5K and one-mile fun run. 8:00 AM CT. Nelson Building, 1311 Balboa Avenue, Panama City, Florida 32401. Event web page. Entry form and flyer. Online registration at active.com. 2nd annual Rock 'n' Run 5k and Kids Musical Mile Fun Run. 8:00 AM CT. Westgate Park, 501 Recreation Road, Dothan, Alabama 36303. Online registration at EventBrite.com. 10th annual Albany Marathon and Half-Marathon. 7:00 AM ET. Veteran's Park, 112 North Front Street, Albany, GA 31701. 2015 story. 2014 story. 2013 story. 2011 story. 1912 story. USATF certified course GA07003WC (Marathon), GA07002WC (half-Marathon). Event web site. Entry form and flyer. Online registration at active.com. info@albanymarathon.com or 229-317-4760. 2nd annual Bulldog Dash 5K and one-mile fun run. 8:30 AM ET 5K / 9:30 AM ET one mile. MacIntyre Park Middle School, 117 Glenwood Drive, Thomasville, Georgia 31792. 2015 story. Event web site. Event page on Facebook. Entry form and flyer. Angie Ellis ellisa@tcitys.org or 229-225-2628. Go Wild! Mural City 5K. 9:00 AM CT. Poplar Head Park, 126 North Saint Andrews Street, Dothan, Alabama 36303. Online registration at active.com. 2nd annual Ignite the Night 5K. 5:00 PM CT. Citizen's Lodge, 4574 Lodge Drive, Marianna, Florida 32446. Online registration at EventBrite.com. 38th annual Winston Howell 5K Road Race. 9:00 AM CT. National Guard Armory, Highway 52 and 167, Hartford, Alabama 36344. 2015 story. 2014 story. 2013 story. 2011 story. Event web site. Entry form and flyer. Cary Hatcher at cary.hatcher@gmail.com or 334-588-2343; Mike Kinman at mikek@fnbhartford.com or 334-684-9818. 16th annual Smoothie King 5K and one-mile fun run. 8:00 AM ET. Valdosta State University Recreation Center, 1300 Sustella Avenue, Valdosta, Georgia 31698. 2015 story. 2014 story. 2011 story. Online registration. 3rd annual Breeze By The Bay 10K and 5K. 9:00 AM ET. Port Saint Joe High School, 101 Shark Drive, Port Saint Joe, Florida 32456. 2015 story. Event page on Facebook. Online registration at active.com. jslpsj@gmail.com or Michelle Perrin 850-899-0094. 6th annual Anglers On The Run 10K, 5K and one-mile fun run. 7:30 AM CT 10K / 8:00 AM CT 5K / 9:00 AM CT one mile. Deer Point Elementary School, 4800 Highway 2321, Panama City, Florida 32404. Online registration at active.com. McGuire's 39th annual St. Patrick's Day Prediction 5K. 9:00 AM CT. McGuire’s Irish Pub, 600 East Gregory Street, Pensacola, Florida 32502. USATF certified 5K course FL14026EBM. Online registration at RunSignUp.com. 3rd annual Wild Azalea Festival Family Fun Run 5K. 9:00 AM ET. White Springs Visitor Center, 10499 Spring Street, White Springs, Florida 32096. Online registration at RaceEntry.com. Florida High FAN 5K and one-mile fun run. 8:30 AM ET one mile / 9:00 AM ET 5K. Florida State University School, 3000 Schoolhouse Road, Tallahassee, Florida 32311. USATF certified course FL15107EBM (5K). Event page on Facebook. Entry form and flyer. Online registration at EventBrite.com. 2nd annual Artists In Bloom 5K. 8:00 AM ET. The Set On FAMU, 1628 Martin Luther King Boulevard, Tallahassee, Florida. Mike LaBossierre michael.labossiere@famu.edu or Tanya Tatum tanya.tatum@famu.edu. Gulf Winds Track Club's 41st annual Springtime 10K, 5K and one-mile kids' run. 7:45 AM ET one-mile / 8:10 AM ET 10K and 5K. Leon County Courthouse, 301 S Monroe St, Tallahassee, FL 32301. 2015 story. 2014 story. 2013 story. 2012 story. 2011 story. 2010 story. 2009 story. USATF-certifed course FL12022EBM (10K). USATF-certifed course FL11045EBM (5K). Event web site. Online registration at active.com. springtime10k@gmail.com. 5th annual Gainesville Education For Life 5K. 8:30 AM ET. Westside Park, 1001 NW 34th Street, Gainesville, Florida 32605. Event web page. Event page on Facebook. Online registration at active.com. Amber R. Tynan, atynan@southernscholarship.org or 850-222-3833. Road Kill 5K. 8:00 AM ET. Reed Bingham State Park, 542 Reed Bingham Road, Adel, Georgia 31620. 2015 story. 2014 story. 2013 story. 2012 story. USATF certified course GA11076WC.